dissertation), I saw first-hand how the process in which decisions are made is at least, if not more, important as the choices themselves. As clinicians, however, we often find ourselves perplexed by patients’ decision making. Anticipating and predicting patient decision making would help clinicians who are responsible for supporting and guiding patients through the process, which at times may feel like gazing into a proverbial crystal ball. In my PhD program I began to look at different frameworks that exist to explain, if not predict, decision outcomes among older adults, particularly at the end of life. Prospect theory1 is one important theory that attempts to explain decision making, though in the area of economics. Not only is the original paper one of the most frequently cited papers ever published,2 but the theory has been rigorously tested through numerous studies in a wide variety of fields. I became interested in prospect theory because it has emerged as a potential framework in healthcare decisions and shows great promise. However, I was struck by one aspect to the existing healthcare research: how the commodity is determined. This commodity is a continuum on which a choice can be measured as a gain or a loss. In economics, the commodity has generally been a purely monetary measure. This is easily measured and constructed as everyone has a sense of what $100 is, even if it is more or less important based on one’s financial situation. In healthcare, the commodity has been measured not so much from patients’ perspectives but from an objective clinical criterion of health. In this study we found that participants’ subjective perceptions of health were markedly different than those determine by traditional clinical measures. While clinicians may use disability or comorbidity as a commodity on which to value choices that is indeed objective, participants were determining their health differently. Not only that, they were trying to value choices on two competing criteria: their desire to live as long as possible and their hope to maintain a high quality of life. By using prospect theory as an a priori framework in this analysis, we bring important innovations to our understanding of the theory as it is used in healthcare. First, we chose to look at commodities of health status and prognosis as the participants defined them. Thus, rather than using their clinical status and prognosis – which was poor for all the participants – we relied on their personal perceptions as this is the point of reference from which they make decisions. Second, we examined how these two commodities were being utilized together, as it became apparent our participants were valuing choices on both. Even those who felt they were in the best of health didn’t make choices solely on that criterion; rather, they still considered how long they felt they had to live. Likewise, those who felt they had a very short prognosis still “wanted a chance,” as one participant put it. What we discovered is that participants were trying to achieve a delicate balance between the two and that using multiple criteria appears to become more and more important as ones health declined. As they approach the end of life, they are not willing to sacrifice quality of life completely to live as long as possible. Instead, they want a happy medium. This desire to use two commodities seems unique to end-of-life decisions and was not fully addressed by prospect theory. Is theory needed to understand decision making at this specific time of life? We argue yes. Theory is important both to clinical practice and research. Because clinicians are called upon to resolve the discordant views patients may have of both their health and prognosis, they greatly benefit from understanding this important balancing act. Clinics need to help patients navigate through the complex choices around end-of-life care. While “correcting” patients’ subjective self-assessments may seem like taking away hope, patients cannot make the value-based decisions they say are important without fully understanding the true nature of their situations. Our participants understood this and looked to providers to guide them – and in many cases, to simply make decisions for them. Besides its value for clinicians and patients, theory plays an important role from the research perspective, as it helps us identify what needs to be studied, and by extension, what interventions may be helpful. Theory also helps us determine where interventions can be applied. Despite all the research that has been done in end-of-life decision making, older adults frequently continue to receive care that is \inconsistent with long-held views, so we continue to have a weak understanding of how older adults are making these choices. In this paper we propose an extended view of prospect theory that can be used to better frame decision making at this unique and challenging time of life. We do not propose this extension as the definitive statement on theory related to end-of-life decision making. We cannot yet offer ways to test and validate our perspective. Rather, we seek to start a dialog that will lead to new and innovative thinking in end-of-life decision making, particularly when the decisions transition from choices about what one would want in an abstract future to what one does want in a concrete reality of today. There are, and will be, detractors of our perspective of prospect theory. 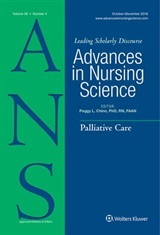 We welcome this and hope our manuscript initiates a long, vibrant conversation that will indeed push the envelope and prompt further research that enables us to ensure older adults at the end of life receive high-quality care that is consistent with their own values and goals at the end of life. Kahneman D, Tversky A. Prospect theory: an analysis of decision under risk. 1979;47(2):263-292. Wu G, Zhang J, Gonzalez R. Decision under risk. In: Koehler DJ, Harvey N, eds. Blackwell Handbook of Judgment and Decision Making. Malden, MA: Blackwell Publishing; 2004: 399-423.